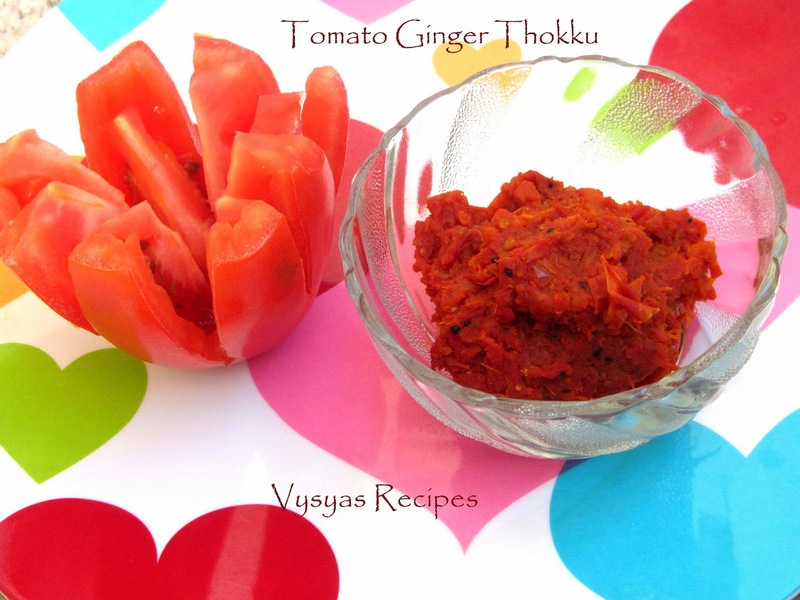 Tomato Ginger Thokku is a simple all purpose recipe, is a good accompaniment for idli,dosa, chapathi,appam, bonda,vada,rice,curd rice, rava dosa,upma, uppu pindi,andra pappu and much more.you can take it for tour which stays for 2 days. Ginger contains chromium, magnesium and zinc which can help to improve blood flow, as well as help prevent chills, fever, and excessive sweat. Ginger is ideal in assisting digestion, thereby improving food absorption and avoiding possible stomach ache. Ginger appears to reduce inflammation in a similar way to aspirin and ibuprofen.With high levels of vitamins E, A and C, as well as copper, tomatoes are a pretty good menu choice if you want to keep your eyes in top condition, but they also have a few secret ingredients that make them a super food for your eyes. Dry Roast 1/4 tsp of fenu greek seeds, till it turns brown, then powder it in a blender or mixie to get fenugreek powder, and keep it aside. Heat the oil, add mustard seeds, when it splutters, add hing, add grated Ginger saute in a oil for few seconds. Then add finely chopped tomatoes, turmeric, chilli powder, salt. cook it covered, saute frequently, till all the water, in the tomatoes are absorbed and comes in the form of thokku.it nearly takes half an hour to absorb all the water. Finally add fenugreek powder and saute for 2 to 3 minutes, till it leaves the sides of the kadai. Retain it outside for 1 or 2 days. you can refigerate it for 10 to 15 days. Lovely thokku. First time here. Nice space. Do visit mine if you find time and leave your valuable comments.